Hi everyone, I recently shared two cards inspired by a project on page 9 of the first Sale-A-Bration catalogue. 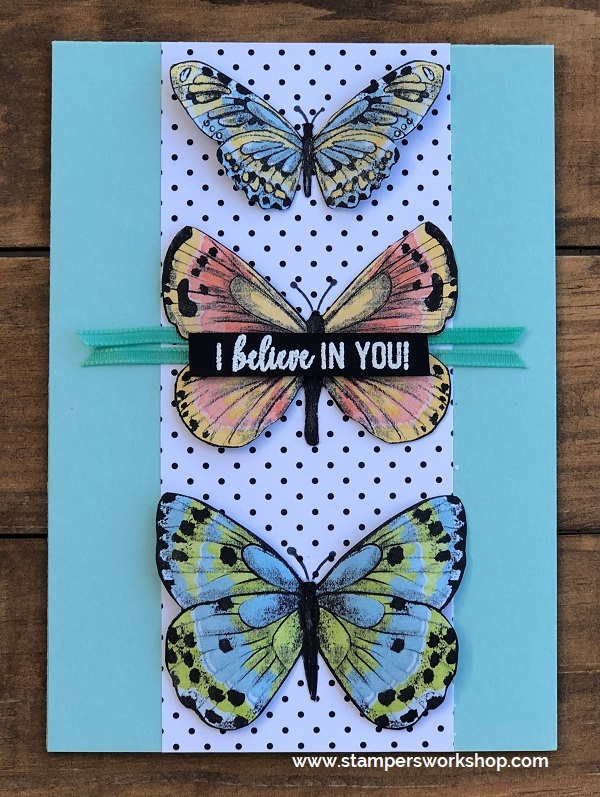 The catalogue sample featured a clear acetate box filled with Coastal Cabana cards and secured by a belly band of the super cute butterflies which had been cut out from the Botanical Butterfly Designer Series Paper. It was so pretty. At the time I mentioned how I thought you could select any colour from the patterned paper to use as your base card and then make a set of cards. I thought they’d look so lovely. One of my friends suggested I should do this and so today I am sharing another couple of cards based on the original design. 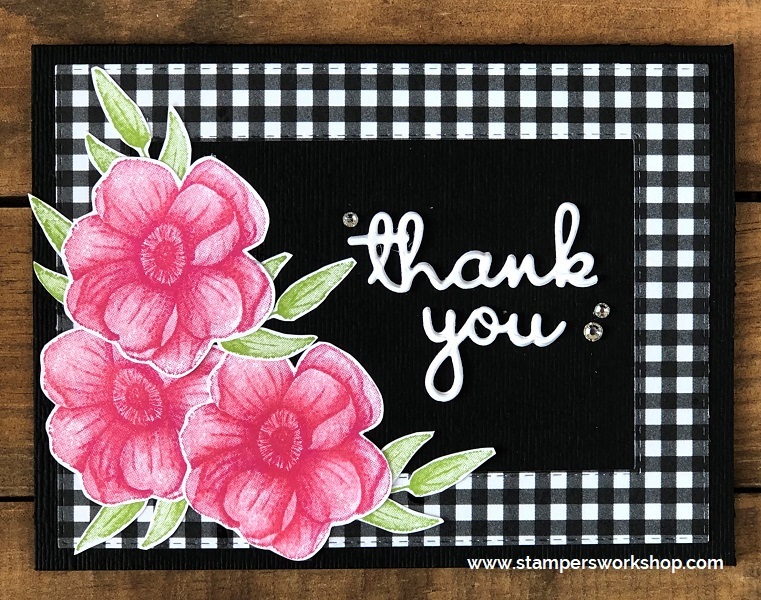 This project illustrates so perfectly one of the things I love about Stampin’ Up! – the way everything coordinates so beautifully! It really takes out half the guesswork, especially if you don’t feel confident with your colours. The first card features Grapefruit Grove. Isn’t it lovely! Next up was Highland Heather. Aren’t they beautiful! The only change I made with this card is that I used the Subtle embossing folder to add some more texture to the base card. I totally love this look and now I have a cute set of cards to gift! Hi everyone, you’ve often heard me talk about how fantastic the catalogue is for providing inspiration. I think the samples are AMAZING! Sometimes the sample I love is a 3D project and I rarely do them. So instead of thinking I can’t (or won’t) make that project, I think about how I might be able to convert it to a card. Sometimes that is a very easy process – like today’s cards. Other times, it is a little more complicated. I was inspired by a project on page 9 of the first Sale-A-Bration catalogue. 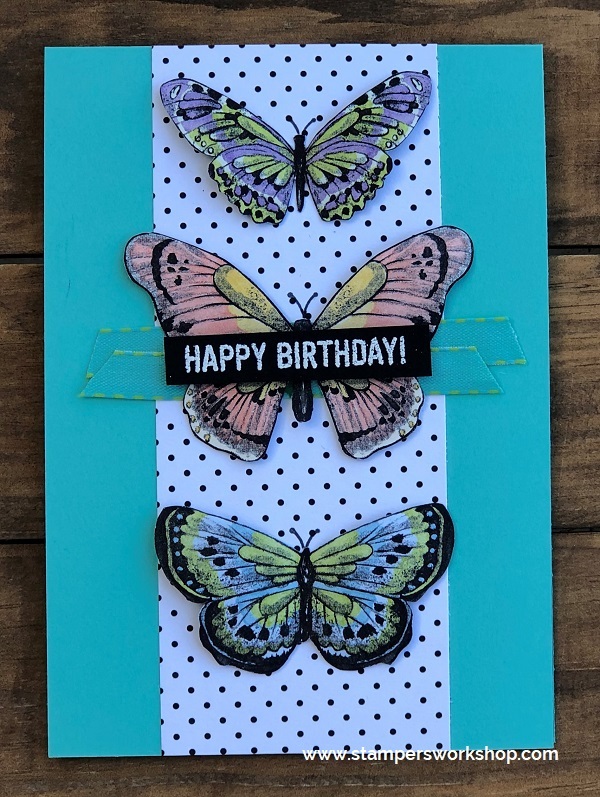 It features a clear acetate box filled with Coastal Cabana cards and secured by a belly band of the super cute butterflies which had been cut out from the Botanical Butterfly Designer Series Paper. It looks good. I had to give it a try. The fiddliest part is cutting out the butterflies but even that doesn’t take too long. I didn’t worry about saving the antenna either. 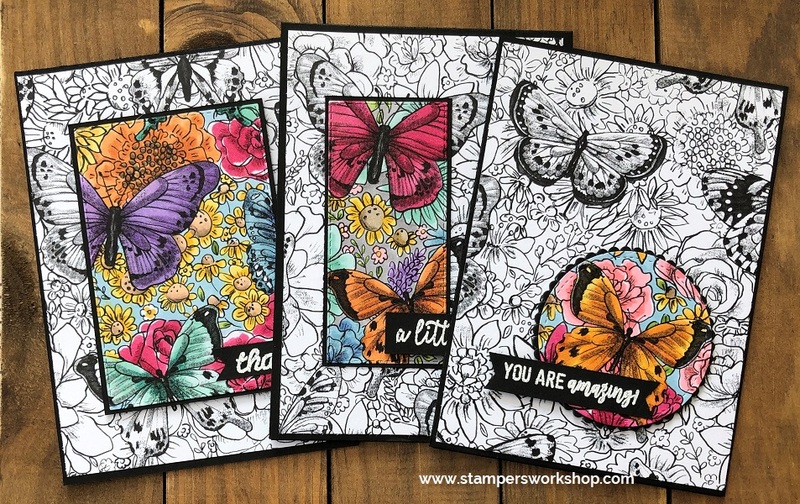 I stamped them on later using the Butterfly Gala stamp set. You could also draw them on with a black marker if you wanted. I used Wink of Stella to add a bit more sparkle to the butterflies. It really gave them a lift! After making the above card, I had to make another one but this time chose Pool Party as my base. So pretty. Seriously, isn’t this the cutest! I think you could pick out any of the colours in the patterned paper and use that as your base. Pick up a spool of the Whisper White 1/8″ Sheer Ribbon and you can colour it to match any of the backgrounds you like. So effective! Hi everyone, I’ve shared a couple of cards showcasing the Spotlight Technique featuring the Botanical Butterfly DSP recently. 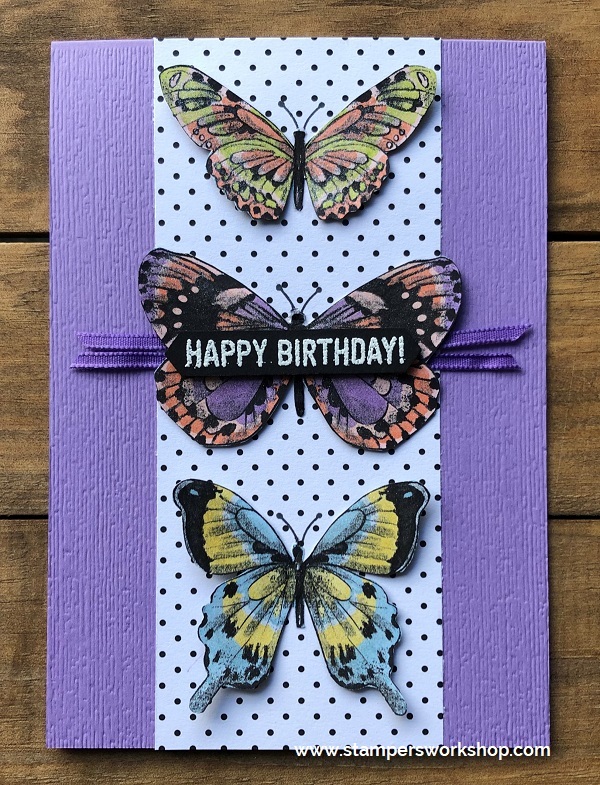 It is such a fun technique and the Botanical Butterfly DSP is perfect to create cards which WOW! 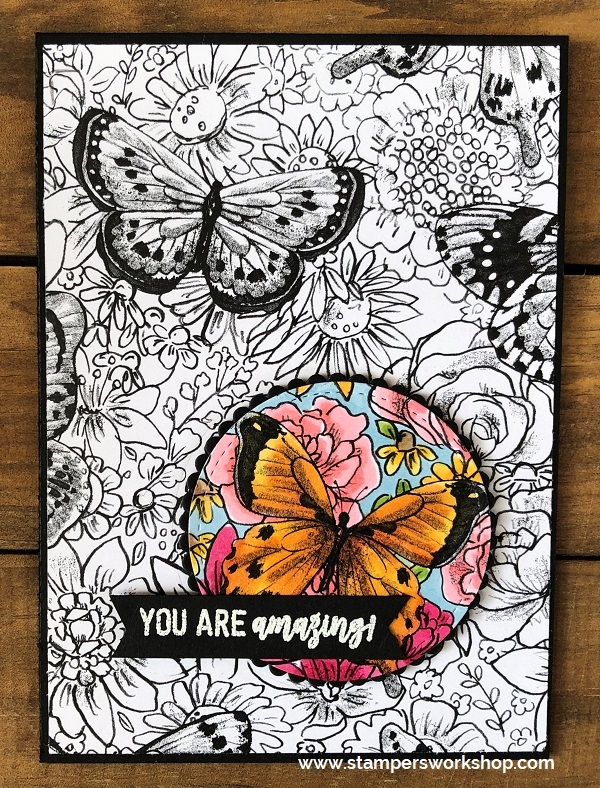 Take a sheet of the black and white illustrated paper from the Botanical Butterfly DSP. Select the area which you want to spotlight. Once you have identified it, use a post-it note to hold the die in place. Trim the paper to fit the black card base. This panel is then run through the Big Shot to cut out the rectangle you are going to spotlight. 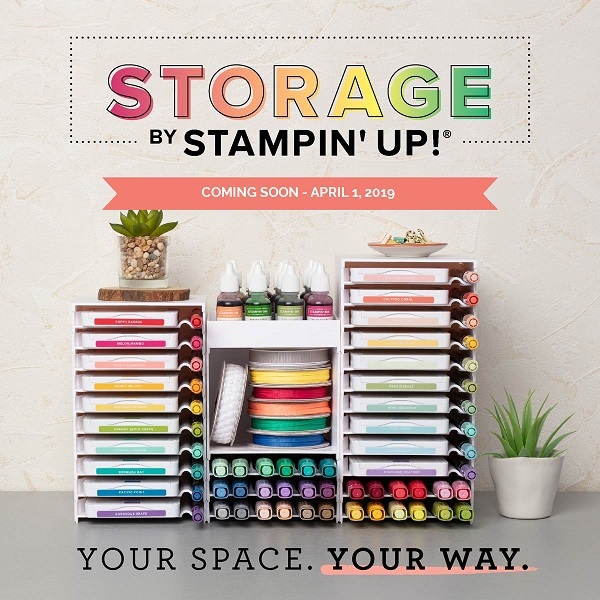 I coloured in the panel with my Stampin’ Blends (you can any colouring medium you prefer). Once the panel is coloured, mat it on black cardstock. I added some Stampin’ Dimensionals to the back of the panel and then positioned it in place on the card being careful to align it perfectly. Don’t the cards look fantastic? I LOVE this technique. I also think this would make a great gift set. 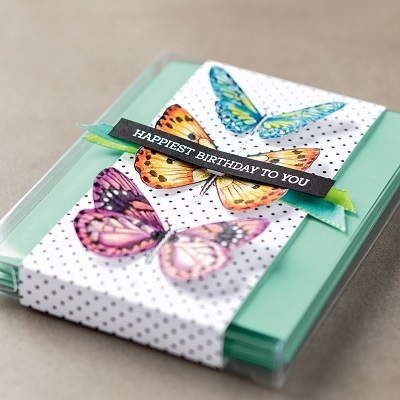 The Botanical Butterfly DSP is only available as a FREE item with qualifying orders during Sale-A-Bration. Sale-A-Bration ends at the end of the month. So, please, don’t delay if you like this paper, or indeed, any of the Sale-A-Bration freebies. Hi everyone, I had such a great response to the Spotlight Technique featuring the Botanical Butterfly DSP card I recently featured that I decided to make another one. 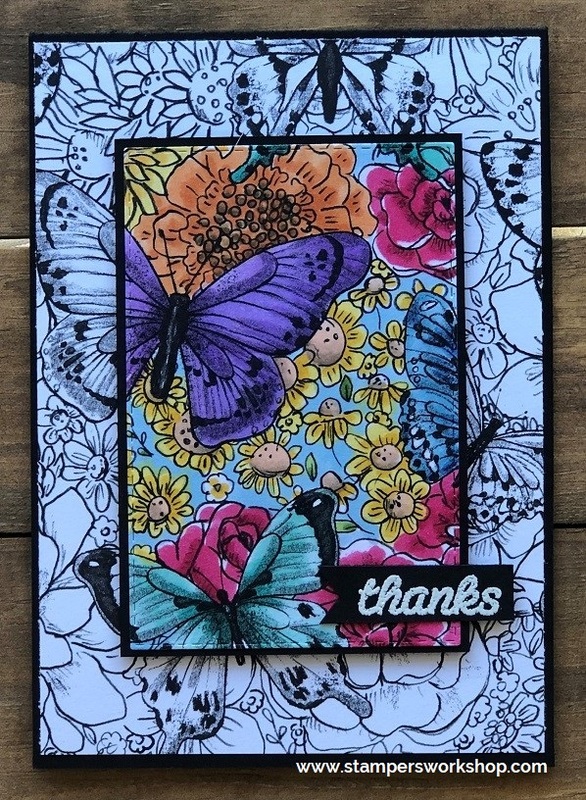 I’ve used nearly all the same supplies, except this time, I am using the Layering Circle Framelits Dies and a new stamp set – Amazing Life. 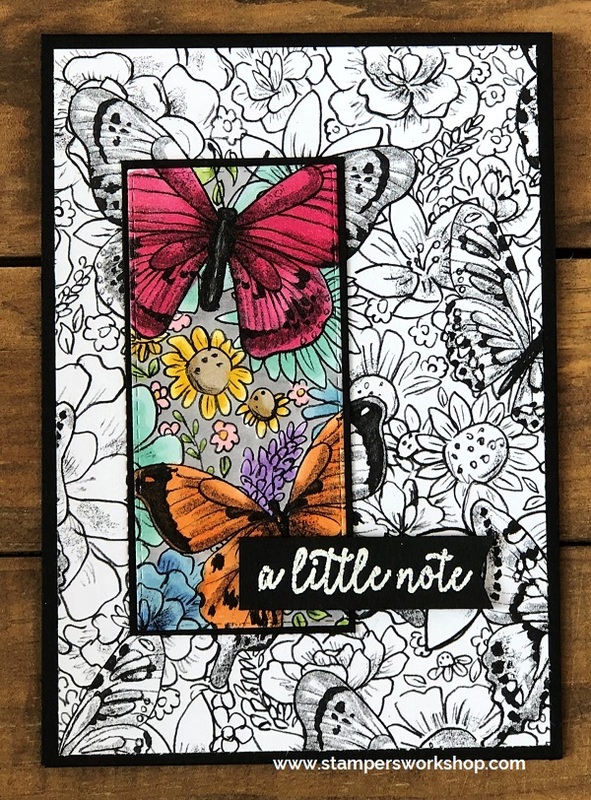 To begin with, take the black and white illustrated paper from the Botanical Butterfly DSP. Select the area which you want to spotlight. Once you have identified it, I use a post-it note to hold the circle die in place. I then trim the paper to fit my black card base. This panel is then run through the Big Shot to cut out the circle you are going to spotlight. Whilst the Big Shot was out, I also cut out a scalloped circle to frame the spotlight panel. Of course, I did use the Stampin’ Blends to colour in the panel but you can any colouring medium you prefer. Just keep in mind that it is not designed for colouring with blends so the ink won’t blend as easily as it does on Whisper White cardstock. I LOVE this technique. It really is quick and easy and has that WOW factor! I hope you’ll give it a try soon. 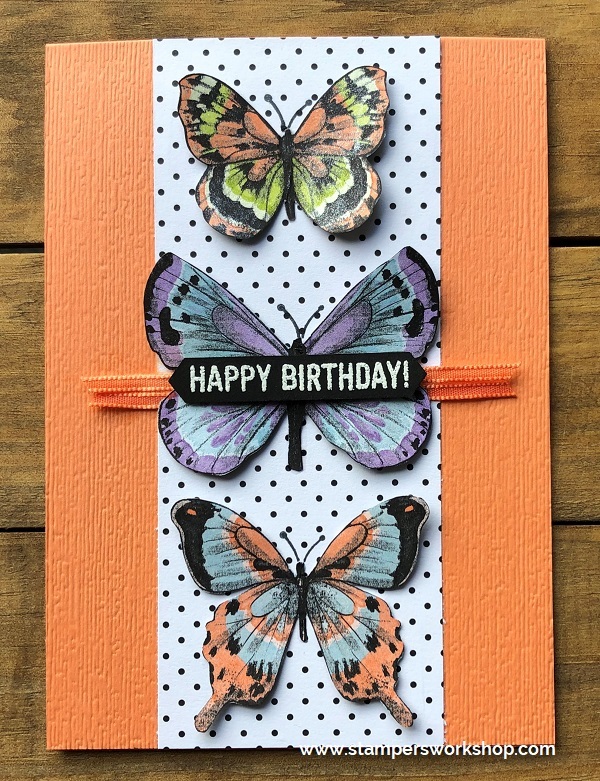 Don’t forget the Botanical Butterfly DSP is only available as a FREE item with qualifying orders during Sale-A-Bration. Sadly, Sale-A-Bration ends at the end of the month. So, please, don’t delay if you like this paper, or indeed, any of the Sale-A-Bration freebies. Hi everyone, when I was making my Brother-In-Law’s birthday card (which you can see here), my partner was offering me creative suggestions and one of them was to create a frame and have the beer bottles pop through. Whilst I didn’t end up using that idea at the time, it stuck with me and I really wanted to use it on another card. To create the gingham frame, I used the new Rectangle Stitched Framelits Dies on the Botanical Butterflies DSP. I picked out the largest and the third largest of the dies and held them in position with some post-it note tape as I didn’t want the dies to shift as I ran them through the Big Shot. Doesn’t it look effective? I kept the centre panel which was cut out for use on another card project. While the Big Shot was out I also ran through the “thanks” and the “you” dies from the Well Written Die Set. When diecutting intricate dies I like to make sure I apply Multipurpose Adhesive Sheets to the cardstock before I die cut. This makes it so much easier to adhere the die cut pieces, especially when layering them as I did for the sentiment. 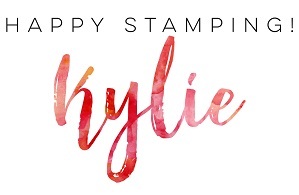 I used the Painted Seasons stamp set (which you can earn for free with a qualifying order during Sale-A-Bration). I actually fussy cut out the images but there are now coordinating dies!! YAY! That would have saved me quite a bit of time. I love the colour combination. The Melon Mambo with the Granny Apple Green really pops against the gingham background. I love this look so much and will definitely be returning to it in the future!